747 BC – Epoch (origin) of Ptolemy's Nabonassar Era. 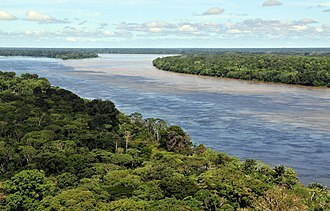 1606 – The Janszoon voyage of 1605–06 becomes the first European expedition to sight Australia, although it is mistaken as a part of New Guinea. 1616 – Galileo Galilei is formally banned by the Roman Catholic Church from teaching or defending the view that the earth orbits the sun. 1794 – The first Christiansborg Palace in Copenhagen burns down. 1815 – Napoleon Bonaparte escapes from Elba. 1876 – Japan and Korea sign a treaty granting Japanese citizens extraterritoriality rights, opening three ports to Japanese trade, and ending Korea's status as a tributary state of Qing dynasty China. 1914 – HMHS Britannic, sister to the RMS Titanic, is launched at Harland and Wolff shipyard in Belfast. 1919 – President Woodrow Wilson signs an act of Congress establishing the Grand Canyon National Park. 1929 – President Calvin Coolidge signs an executive order establishing the 96,000 acre Grand Teton National Park in Wyoming. 1936 – In the February 26 Incident, young Japanese military officers attempt to stage a coup against the government. 1952 – Vincent Massey is sworn in as the first Canadian-born Governor General of Canada. 1960 – A New York-bound Alitalia airliner crashes into a cemetery in Shannon, Ireland, shortly after takeoff, killing 34 of the 52 persons on board. 1971 – U.N. Secretary-General U Thant signs United Nations proclamation of the vernal equinox as Earth Day. 1979 – The Superliner railcar enters revenue service with Amtrak. 1980 – Egypt and Israel establish full diplomatic relations. 1987 – Iran–Contra affair: The Tower Commission rebukes President Ronald Reagan for not controlling his national security staff. 1992 – Nagorno-Karabakh War: Khojaly Massacre: Armenian armed forces open fire on Azeri civilians at a military post outside the town of Khojaly leaving hundreds dead. 1993 – World Trade Center bombing: In New York City, a truck bomb parked below the North Tower of the World Trade Center explodes, killing six and injuring over a thousand. 1995 – The UK's oldest investment banking institute, Barings Bank, collapses after a rogue securities broker Nick Leeson loses $1.4 billion by speculating on the Singapore International Monetary Exchange using futures contracts. 2008 – The New York Philharmonic performs in Pyongyang, North Korea; this is the first event of its kind to take place in North Korea. 2012 – Trayvon Martin was shot and killed at the age of 17 in Sanford, Florida. 2012 – A train derails in Burlington, Ontario, Canada killing at least three people and injuring 45. 2013 – A hot air balloon crashes near Luxor, Egypt, killing 19 people. ^ Olimpijski, Polski Komitet. "Biografie • Polski Komitet Olimpijski". www.olimpijski.pl (in Polish). Retrieved 2017-10-24. ^ Alexandre Dumas's death act, February 27, 1806, Musée Alexandre Dumas (Villers-Cotterêts, France). 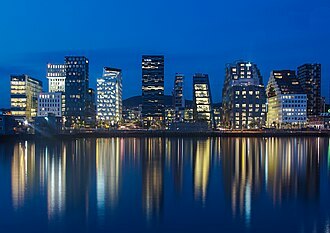 Wikimedia Commons has media related to February 26. The Battle of Benevento was fought on 26 February 1266 near Benevento, in present-day Southern Italy. It was waged between the troops of Charles of Anjou and Manfred of Sicily, Manfreds defeat and death resulted in the capture of the Kingdom of Sicily by Charles, effectively ending the rule of the Hohenstaufen in the Italian Peninsula. The Papacy had long been in conflict with the Imperial house of Hohenstaufen over their rule in Italy, at the time of the battle, the Hohenstaufen ruler in the Kingdom of Sicily was Manfred, illegitimate son of Frederick II, Holy Roman Emperor. While the rightful heir to the kingdom was Fredericks legitimate grandson Conradin, he was young, taking advantage of a false rumor of Conradins death, Manfred had usurped the throne in 1258. Pope Urban IV determined to wrench the Kingdom from him, and in 1263, concluded a treaty with Charles of Anjou. 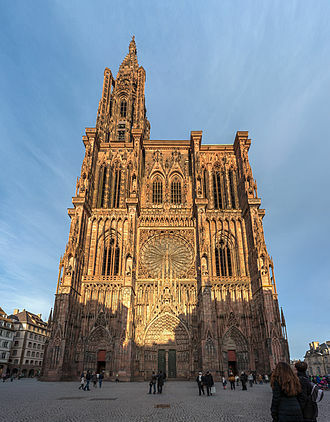 Charles reached Rome in 1265, but was halted by financial embarrassments. Manfred, did not take the field against him until January 1266, alarmed by desertions among his followers and fearing further treachery, Manfred sought to bring Charles to battle as swiftly as possible. Charles had divided his cavalry into three battles, the infantry and the first battle, consisting of 900 Provençals were at the front, commanded by Hugh of Mirepoix, Marshal of France, and Philip of Montfort, Lord of Castres. Behind them were the battle, which consisted of 400 Italians and 1,000 men of Languedoc. 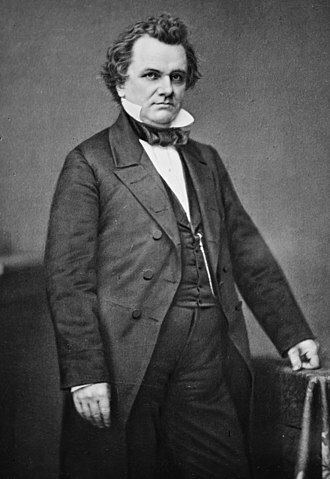 Charles would command the battle in person. Behind them, the battle consisted of about 700 men from the county of Flanders under Gilles II de Trasignies, Constable of France. His Saracen archers were in the fore, behind them was the first battle,1,200 German mercenaries armed in coats of plates, commanded by his cousin Giordano dAnglano and Galvano of Anglona. The second battle consisted of the Italian mercenaries, about 1,000, the third battle, numbering 1,400, were the feudatories of the Kingdom, under Manfreds personal command. The battle began in the morning, when Manfred advanced his Saracens across the bridge to skirmish and they drove off Charles infantry, but were put to flight by his Provençal cavalry. In 1610, Galileo published his Sidereus Nuncius, describing the surprising observations that he had made with the new telescope, namely the phases of Venus and the Galilean moons of Jupiter. With these observations he promoted the theory of Nicolaus Copernicus. Galileos initial discoveries were met with opposition within the Catholic Church, heliocentric books were banned and Galileo was ordered to refrain from holding, teaching or defending heliocentric ideas. Galileo went on to propose a theory of tides in 1616, in 1632 Galileo, now an old man, published his Dialogue Concerning the Two Chief World Systems, which implicitly defended heliocentrism, and was immensely popular. Galileo was kept under house arrest until his death in 1642, other observations followed, including the phases of Venus and the existence of sunspots. In 1611, Galileo visited the Collegium Romanum in Rome, where the Jesuit astronomers by that time had repeated his observations, just as the asp stops its ears, so do these philosophers shut their eyes to the light of truth. Brahe argued that the distance to the stars in the Copernican system would have to be 700 times greater than the distance from the sun to Saturn, Galileo became involved in a dispute over priority in the discovery of sunspots with Christoph Scheiner, a Jesuit. 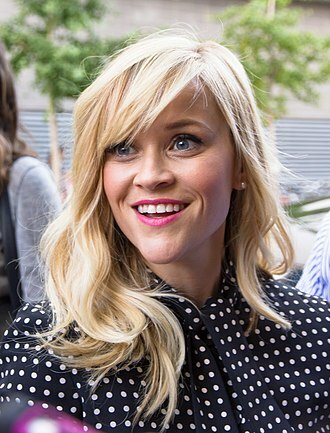 This became a lifelong feud. Neither of them, was the first to recognise sunspots—the Chinese had already been familiar with them for centuries, at this time, Galileo engaged in a dispute over the reasons that objects float or sink in water, siding with Archimedes against Aristotle. The debate was unfriendly, and Galileos blunt and sometimes sarcastic style, though not extraordinary in academic debates of the time, according to Cigoli, one of the plotters asked a priest to denounce Galileos views from the pulpit, but the latter refused. Nevertheless, three years another priest, Tommaso Caccini, did in fact do precisely that, as described below. Geostaticism agreed with an interpretation of Scripture in several places, such as 1 Chronicles 16,30, Psalm 93,1, Psalm 96,10, Psalm 104,5. Heliocentrism, the theory that the Earth was a planet, which along with all the others revolved around the Sun, contradicted both geocentrism and the prevailing theological support of the theory. One of the first suggestions of heresy that Galileo had to deal with came in 1613 from a professor of philosophy and specialist in Greek literature, Galileo was defended on the spot by his former student Benedetto Castelli, now a professor of mathematics and Benedictine abbot. Later, in 1615, he expanded this into his much longer Letter to the Grand Duchess Christina, in late 1614 or early 1615, one of Caccinis fellow Dominicans, Niccolò Lorini, acquired a copy of Galileos letter to Castelli. Lorini and other Dominicans at the Convent of San Marco considered the letter of doubtful orthodoxy and his colleagues decided to bring Galileos letter to the attention of the Inquisition. Were taking it upon themselves to expound the Holy Scripture according to their private lights, on March 19, Caccini arrived at the Inquisitions offices in Rome to denounce Galileo for his Copernicanism and various other alleged heresies supposedly being spread by his pupils. The Mongol conquest of the Jin dynasty, known as the Mongol–Jin War, was fought between the Mongol Empire and the Jurchen-led Jin dynasty in Manchuria and north China. The war, which started in 1211, lasted over 23 years, the Jurchen rulers of the Jin dynasty collected tribute from some of the nomadic tribes living on the Mongol steppes and encouraged rivalries among them. When the Mongols were unified under Khabul in the 12th century, the Jurchens encouraged the Tatars to destroy them, the Tatars eventually captured Khabuls successor and handed him over to the Jin imperial court. Emperor Xizong of the Jin dynasty ordered had Ambaghai executed by crucifixion, the Jin dynasty conducted regular punitive expeditions against the Mongol nomads, either enslaving or killing them. In 1210, a delegation arrived at the court of Genghis Khan to proclaim the ascension of Wanyan Yongji to the Jin throne, because the Jurchens defeated the powerful steppe nomads and allied with the Keraites and the Tatars, they claimed sovereignty over all the tribes of the steppe. 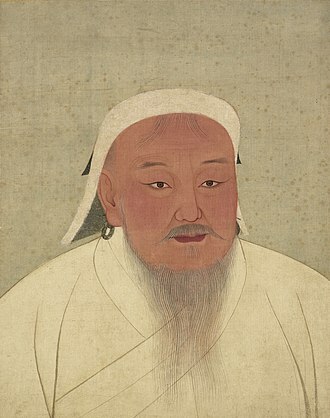 High court officials in the Jin government defected to the Mongols, but fearful of a trap or some other nefarious scheme, Genghis Khan refused. His defiance of the Jin envoys was tantamount to a declaration of war between the Mongols and Jurchens, after Genghis Khan returned to the Kherlen River, in the spring of 1211, he summoned a kurultai. By organising a long discussion, everyone in the community was included in the process, the Khan prayed privately on a nearby mountain. He removed his hat and belt, bowed down before the Eternal Sky and he explained that he had not sought this war against the Jurchens. At the dawn on the day, Genghis Khan emerged with the verdict, The Eternal Blue Sky has promised us victory. Wanyan Yongji, angry on hearing how Genghis Khan behaved, sent the message to the Khan that Our Empire is like the sea, yours is, when the conquest of the Tangut-led Western Xia empire started, there were multiple raids between 1207-1209. When the Mongols invaded Jin territory in 1211, Ala Qush, the first important battle between the Mongol Empire and the Jin dynasty was the Battle of Yehuling at a mountain pass in Zhangjiakou which took place in 1211. Valentinian I, known as Valentinian the Great, was Roman emperor from 364 to 375. Upon becoming emperor he made his brother Valens his co-emperor, giving him rule of the provinces while Valentinian retained the west. During his reign, Valentinian fought successfully against the Alamanni, most notable was his victory over the Alamanni in 367 at the Battle of Solicinium. His brilliant general Count Theodosius defeated a revolt in Africa and the Great Conspiracy, an assault on Roman Britain by Picts, Scots. Valentinian was the last emperor to conduct campaigns across both the Rhine and Danube rivers, Valentinian rebuilt and improved the fortifications along the frontiers, even building fortresses in enemy territory. Due to the nature of his reign and the rapid decline of the empire after his death. He founded the Valentinian Dynasty, with his sons Gratian and Valentinian II succeeding him in the half of the empire. 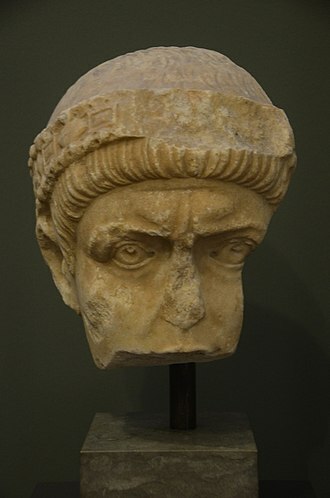 Valentinian was born in 321 at Cibalae in southern Pannonia and his younger brother Valens were the sons of Gratianus Major, a prominent commander during the reigns of emperors Constantine I and Constans I. 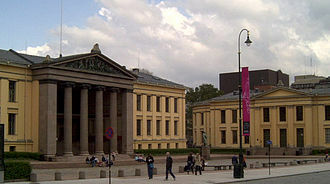 He and his brother grew up on the estate where they were educated in a variety of subjects. Gratian the Elder was promoted to Comes Africae in the late 320s or early 330s, Gratian was soon accused of embezzlement and was forced to retire. Valentinian joined the army in the late 330s and acquired the position of protector domesticus. 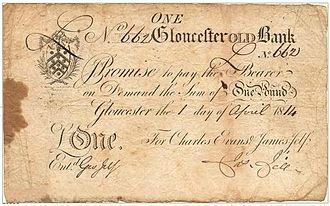 Gratian was recalled during the early 340s and was made comes of Britannia, after holding this post, Gratianus retired to the family estate in Cibalae. In 350, Constans I was assassinated by agents of the usurper Magnentius, Constantius II, older brother of Constans and emperor in the East, promptly set forth towards Magnentius with a large army. The following year the two met in Pannonia. The ensuing Battle of Mursa Major resulted in a victory for Constantius. 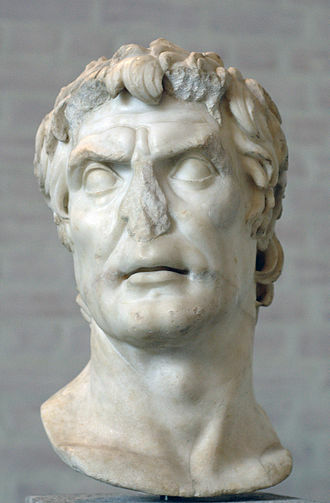 Two years he defeated Magnentius again in southern Gaul at the Battle of Mons Seleucus, now realizing the futility of continuing his revolt, committed suicide in August that year, making Constantius sole ruler of the empire. Manfred was the King of Sicily from 1258 to 1266. 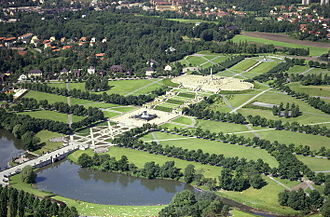 He was a son of the emperor Frederick II of Hohenstaufen. Manfred, who bore his mothers surname, studied in Paris and Bologna and shared with his father a love of poetry. At Fredericks death, although only about 18 years old, acted loyally, the Kingdom was in turmoil, mainly due to riots spurred by Pope Innocent IV. Manfred was able to subdue numerous rebel cities, with the exception of Naples, when his legitimate brother Conrad IV appeared in southern Italy in 1252, disembarking at Siponto, his authority was quickly and generally acknowledged. Naples fell in October 1253 into the hands of Conrad, the latter, in the meantime, had grown distrustful of Manfred, stripping him of all his fiefs and reducing his authority to the principality of Taranto. In May 1254 Conrad died of malaria, after refusing to surrender Sicily to Innocent IV, accepted the regency on behalf of Conradin, the infant son of Conrad. 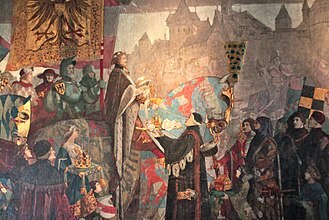 The pope however, having been named guardian of Conradin, excommunicated Manfred in July 1254, the regent decided to open negotiations with Innocent. By a treaty made in September 1254, Apulia passed under the authority of the pope, but Manfred’s suspicions being aroused by the demeanour of the papal retinue, and annoyed by the occupation of Campania by papal troops, he fled to the Saracens at Lucera. Aided by Saracen allies, he defeated the army at Foggia on 2 December 1254, and soon established his authority over Sicily. He thus reached the status of patron of the Ghibelline League, in that year Innocent died, succeeded by Alexander IV, who immediately excommunicated Manfred. In 1257, Manfred crushed the army and settled all the rebellions, imposing his firm rule of southern Italy. The following year, taking advantage of a rumour that Conradin was dead, the falsehood of this report was soon manifest, but the new king, supported by the popular voice, declined to abdicate and pointed out to Conradin’s envoys the necessity for a strong native ruler. The pope, to whom the Saracen alliance was a serious offence, undeterred by the excommunication Manfred sought to obtain power in central and northern Italy, where the Ghibelline leader Ezzelino III da Romano had disappeared. Sicily is the largest island in the Mediterranean Sea. It is an autonomous Region of Italy, along with surrounding minor islands, Sicily is located in the central Mediterranean Sea, south of the Italian Peninsula, from which it is separated by the narrow Strait of Messina. Its most prominent landmark is Mount Etna, the tallest active volcano in Europe, the island has a typical Mediterranean climate. The earliest archaeological evidence of activity on the island dates from as early as 12,000 BC. It became part of Italy in 1860 following the Expedition of the Thousand, a revolt led by Giuseppe Garibaldi during the Italian unification, Sicily was given special status as an autonomous region after the Italian constitutional referendum of 1946. 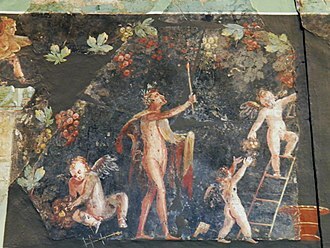 Sicily has a rich and unique culture, especially regard to the arts, literature, cuisine. 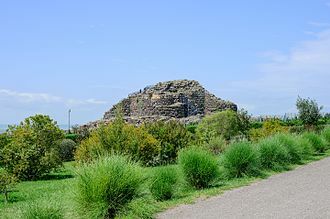 It is home to important archaeological and ancient sites, such as the Necropolis of Pantalica, the Valley of the Temples, Sicily has a roughly triangular shape, earning it the name Trinacria. To the east, it is separated from the Italian mainland by the Strait of Messina, about 3 km wide in the north, and about 16 km wide in the southern part. The northern and southern coasts are each about 280 km long measured as a line, while the eastern coast measures around 180 km. The total area of the island is 25,711 km2, the terrain of inland Sicily is mostly hilly and is intensively cultivated wherever possible. Along the northern coast, the ranges of Madonie,2,000 m, Nebrodi,1,800 m. The cone of Mount Etna dominates the eastern coast, in the southeast lie the lower Hyblaean Mountains,1,000 m. The mines of the Enna and Caltanissetta districts were part of a leading sulphur-producing area throughout the 19th century and its surrounding small islands have some highly active volcanoes. Mount Etna is the largest active volcano in Europe and still casts black ash over the island with its ever-present eruptions and it currently stands 3,329 metres high, though this varies with summit eruptions, the mountain is 21 m lower now than it was in 1981. The Mongol Empire existed during the 13th and 14th centuries and was the largest contiguous land empire in history. The Mongol Empire emerged from the unification of tribes in the Mongol homeland under the leadership of Genghis Khan. The empire grew rapidly under the rule of him and his descendants, the Toluids prevailed after a bloody purge of Ögedeid and Chagataid factions, but disputes continued even among the descendants of Tolui. Kublai successfully took power, but civil war ensued as Kublai sought unsuccessfully to control of the Chagatayid and Ögedeid families. The Battle of Ain Jalut in 1260 marked the point of the Mongol conquests and was the first time a Mongol advance had ever been beaten back in direct combat on the battlefield. In 1304, the three western khanates briefly accepted the suzerainty of the Yuan dynasty, but it was taken by the Han Chinese Ming dynasty in 1368. What is referred to in English as the Mongol Empire was called the Ikh Mongol Uls, in the 1240s, one of Genghiss descendants, Güyük Khan, wrote a letter to Pope Innocent IV which used the preamble Dalai Khagan of the great Mongolian state. After the succession war between Kublai Khan and his brother Ariq Böke, Ariq limited Kublais power to the part of the empire. Kublai officially issued an edict on December 18,1271 to name the country Great Yuan to establish the Yuan dynasty. Some sources state that the full Mongolian name was Dai Ön Yehe Monggul Ulus, the area around Mongolia and parts of North China had been controlled by the Liao dynasty since the 10th century. In 1125, the Jin dynasty founded by the Jurchens overthrew the Liao dynasty, in the 1130s the Jin dynasty rulers, known as the Golden Kings, successfully resisted the Khamag Mongol confederation, ruled at the time by Khabul Khan, great-grandfather of Temujin. The Mongolian plateau was occupied mainly by five powerful tribal confederations, Khamag Mongol, Mergid, khabuls successor was Ambaghai Khan, who was betrayed by the Tatars, handed over to the Jurchen, and executed. The Mongols retaliated by raiding the frontier, resulting in a failed Jurchen counter-attack in 1143, in 1147, the Jin somewhat changed their policy, signing a peace treaty with the Mongols and withdrawing from a score of forts. Heliocentrism is the astronomical model in which the Earth and planets revolve around the Sun at the center of the Solar System. Historically, Heliocentrism was opposed to geocentrism, which placed the Earth at the center, in the following century, Johannes Kepler elaborated upon and expanded this model to include elliptical orbits, and Galileo Galilei presented supporting observations made using a telescope. With the observations of William Herschel, Friedrich Bessel, and others, astronomers realized that the sun, the Ptolemaic system was a sophisticated astronomical system that managed to calculate the positions for the planets to a fair degree of accuracy. 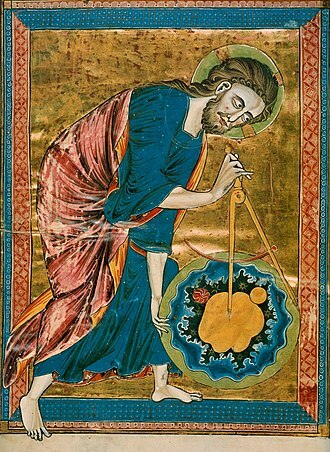 However, he rejected the idea of a spinning earth as absurd as he believed it would create huge winds and his planetary hypotheses were sufficiently real that the distances of moon, sun and stars could be determined by treating orbits celestial spheres as contiguous realities. This system postulated the existence of a counter-earth collinear with the Earth and central fire, the Sun revolved around the central fire once a year, and the stars were stationary. The Earth maintained the same face towards the central fire. 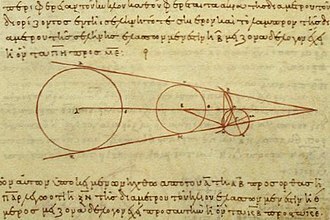 Kepler gave an explanation of the Pythagoreans central fire as the Sun. Heraclides of Pontus said that the rotation of the Earth explained the apparent daily motion of the celestial sphere and it used to be thought that he believed Mercury and Venus to revolve around the Sun, which in turn revolves around the Earth. 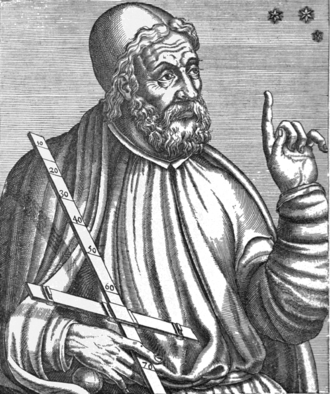 Macrobius Ambrosius Theodosius described this as the Egyptian System, stating that it did not escape the skill of the Egyptians, the first person known to have proposed a heliocentric system, was Aristarchus of Samos. Like Eratosthenes, Aristarchus calculated the size of the Earth, and measured the size and distance of the Moon and Sun, from his estimates, he concluded that the Sun was six to seven times wider than the Earth and thus hundreds of times more voluminous. 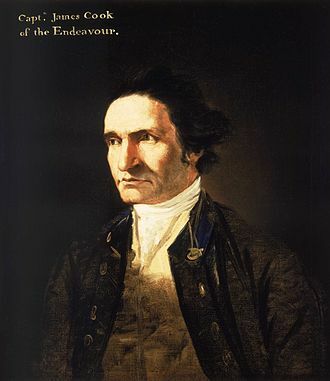 His writings on the system are lost, but some information is known from surviving descriptions and critical commentary by his contemporaries. This is the account as you have heard from astronomers. Solidus of emperor Valentinian I. 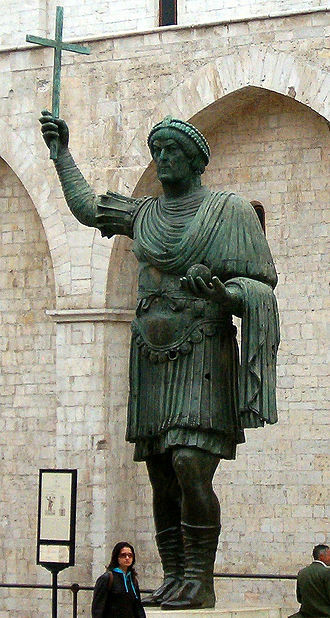 The emperor depicted in the Colossus of Barletta could very well be Valentinian I. The Council of Trent (1545–63) sitting in the Basilica di Santa Maria Maggiore. The Roman Inquisition suspected Galileo of violating the decrees of the Council. Museo Diocesano Tridentino, Trento. 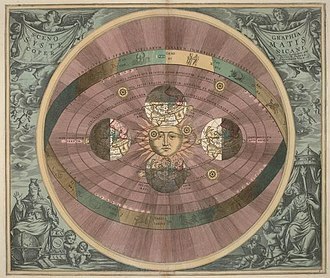 Andreas Cellarius's illustration of the Copernican system, from the Harmonia Macrocosmica (1708). An illustration from al-Biruni's astronomical works explains the different phases of the Moon with respect to the position of the Sun. Nicholas of Cusa, 15th century, asked whether there was any reason to assert that any point was the center of the universe. 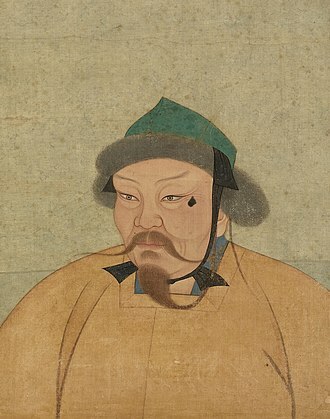 Ögedei Khan (r. 1229–1241), Genghis Khan's son and successor.